Online Recharging is the new trend? Many applications and websites have come up now, that help us recharge our mobiles online, without going to any shop. Apps like Freecharge and Paytm are the new favorites of people who love to save time. So, what do you think? Online Mobile Recharging is the new trend amongst youngsters and busy people? Paytm is a very popular website. You just have to pay online for your recharge using your credit card or other payment options. Paytm supports the following networks : Vodafone, Aircel, Idea, Airtel, Reliance, MTNL, Docomo, Uninor among many others. Paytm not only helps you recharge your mobile online but also can be used for DTH Recharge, Data Card Recharge, Landline Bill payments, Mobile Bill payments, Electricity bill payments, Gas Bill payments and makes life easier. Paytm has its own mobile application that you can download on your smartphone and get these facilities easily. Paytm is very simple to use and it is India’s largest mobile commerce platform. Paytm processed more than 15 Million orders per month. You can also make your data card bill payments via Paytm. Now you can recharge your mobile from anywhere without worrying. You can pay your bills online without the tension of missing the due date. their website and mobile application has a very easy-to-understand interface and there is absolutely no clutter. Other than helping you with mobile recharges and bill payments, Paytm also stocks sports, home and kitchen, stationery, books and other items. thus, Paytm also helps you shop for your needs online. In their online store they have a lot of products like pens, bedsheets, curtains, dresses, watches, belts, mobiles, air-conditioners, ipods, televisions and other items. 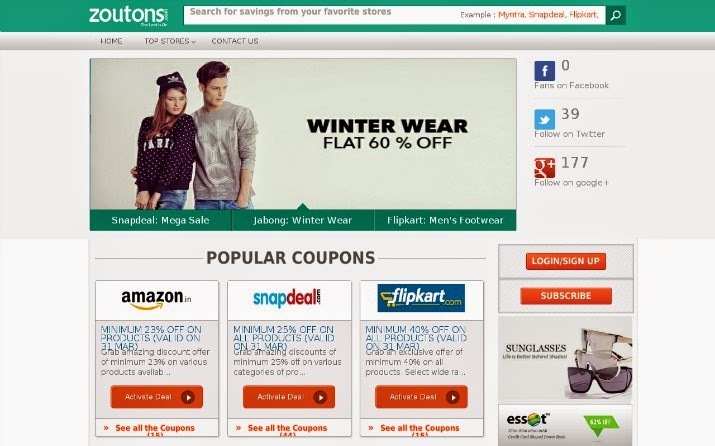 So you can shop online at the comfort of your home and receive your order at your doorstep. No problems and no hassle! Thus, Paytm is an ideal platform you can use to recharge your mobile, pay bills and shop online. I have used freecharge and I must say that they provide really quick service and live upto their claims. Freecharge is India's 1st Online prepaid mobile recharge and top up service providers. Freecharge supports all major networks like Idea, Vodafone, Reliance, Airtel, Aircel, Docomo, etc. 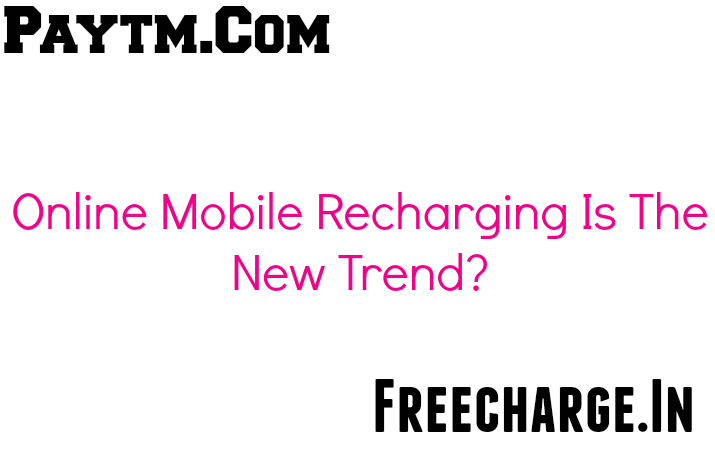 Truly, freecharge provides easy and instant recharge and it's very simple to use. No sooner did I make the payment than I got my recharge. Freecharge is really trustworthy and fast. Not only this, with every recharge that you shop for, freecharge is generous enough to give you vouchers worth an equivalent amount of your recharge. By using those dicsount coupons we can save money while eating out or while watching movies. Redeeming those vouchers are easy too. They deliver the coupons with no delay. You can pay your bills online with Freecharge and you can recharge your DTH, and pay your postpaid bills online. They also provide you a facility to do your data card recharge online. Topups were never so easy. It hardly takes 10 seconds for you to complete your recharge and all you do is make the payment online with ease. 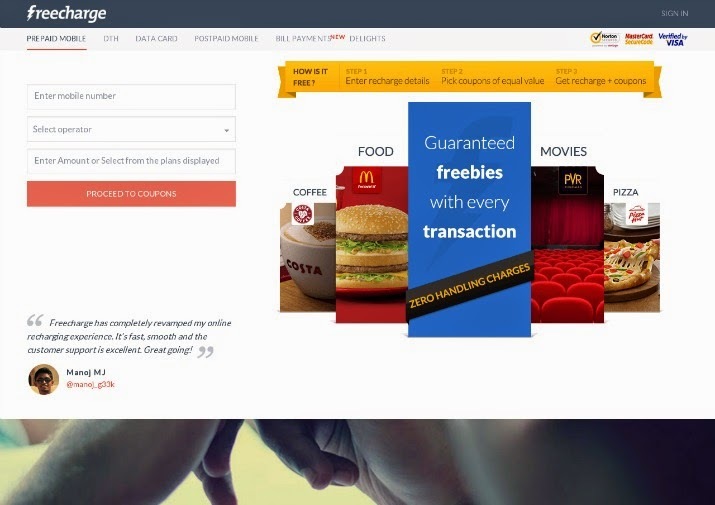 Freecharge is a very secure website and offer easy payment options like Credit card, debit card, cash cards and netbanking. They have over 4 million happy customers and paying your gas and electricity bills has become easy too. All due to freecharge. Overall, freecharge provides a fantastic service. Online recharging is a safe and new trend among the internet addicts. With websites like Paytm and Freecharge our work has become simpler and effortless. There is an amazing website called Zoutons that is a coupons website and I have previously discussed more about Zoutons in my post HERE. On zoutons, you can check out freecharge recharge coupons and Paytm recharge coupons and other online shopping offers, deals and discount coupons.